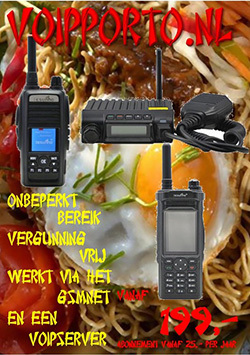 I’ve translated my recent blogpost on ham-dmr.hu, so here’s some info about the Hytera RD625 DMR repeater and about setting up VoIP communications. The blue LED under the D sign is on when the repeater is communicating with the master software. When the repeater connects to the master, a voice says on TS2 TG9 that the reflector 4770 got connected. The repeater doesn’t care about an unplugged Ethernet cable, it won’t ask for a new IP address. It doesn’t care about DHCP lease timeouts, it only asks for an IP address in DHCP mode only when we power it on. All 3G connections are NATted in Hungary, so there’s no external address and connection tracking for the UDP packets, so incoming packets can’t find a way to the repeater. We had the repeater plugged into a Routerboard, which had the 3G stick in it, and we created a VPN tunnel to our server and set the default gateway for that VPN connection. This way we had an external IP address and could set up our firewall to pass through UDP packets destined to the repeater. 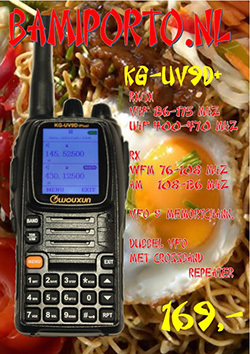 It’s important to mention that an amateur radio network can’t be connected to other telecommunication systems for replacing them, so it’s forbidden to connect the DMR system to the GSM phone network. This post is only about experimentation. I don’t explain all the details about setting up an Asterisk server, there’s a lot of info about it on the net. The structure of the user ID: call type (1 – private, 2 – group) + timeslot + DMR ID, example: 1 – private call, 1 – timeslot, 2161005 – DMR ID, so it’s 112161005. More about on the structure later. This way if we call the number 1 on the SIP server, we will dial DMR user 2161005 with a private call on timeslot 1. First, enable Telephone Interconnection Enable in Phone->Phone System, then enter the Asterisk server’s IP address to Gateway IP. PBX Access Code is the SIP password, Phone Gateway ID is the number, which has to be called on the handheld device in a group or private call. Connect Code should be #1, Disconnect Code should be #2. 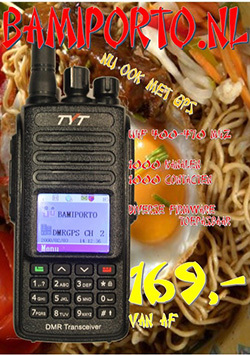 Radio De-key Beep should be enabled, so the called party will hear a beep when we release the PTT so he/she will know when we finished talking and can hear what he/she says. 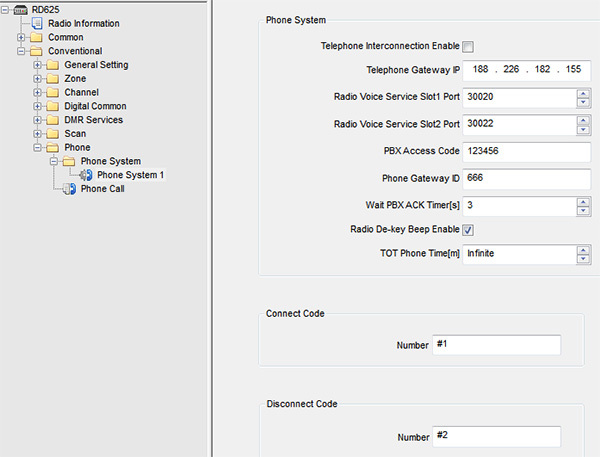 First, we have to add a Phone Systeme in the Hytera CPS at Phone System menu. Set the Phone Gateway ID to the Gateway ID (we tested using the gateway ID 666 as can be seen on the video above), Connect Code button should be set to P1-re, number should be #1, Disconnect Code button should be set to P2, number should be #2. The Phone System should be set to the previously added one on the digital channels where we want to use it. 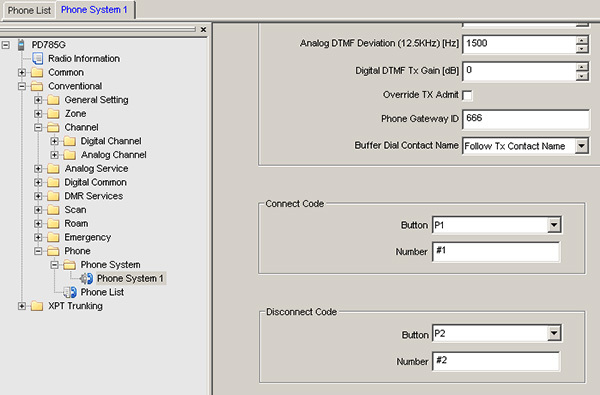 To start a VoIP call from the handheld radio, we have to enter the previously set Gateway ID in a private or a group call, press the PTT continuously, and then we have to enter the number to call (make sure DTMF keypad is previously got enabled in the CPS!). Release the PTT button after entering the number. To pick up an incoming call, press the PTT, press the green button, and then release the PTT. This can be done because we have set the Connect Code button to P1 previously, so pressing P1 will enter the Connect Code (it was set to #1) instantly. To hang up a call, press the PTT, then press the red button, and then release the PTT (this will enter the Disconnect Code). If we enable the Dial-up Mapping in the repeater CPS, then the repeater will try to register to all of the Phone IDs to the SIP server which are in the list. If the SIP server receives a call for a Phone ID, then the repeater will call the Radio ID associated with that Phone ID. If Dial-up Mapping is off, then the repeater will try to register the previously mentioned calltype+timeslot+DMR ID format Radio IDs (not Phone IDs!) on the SIP server. If we add time slot 1, Radio ID 9 as a group call, then it will register on the SIP server with the ID 219. If we call 219 on the SIP server, then the call will be automatically routed to timeslot 1 talk group 9. This call can be interrupted by any DMR user with the usual PTT press + red button + PTT release combination. If we start a call from a Radio ID which is not in the mapping list, then the repeater will try to register it on the SIP server when starting the call. This means that only those DMR users can start a call who has a SIP user in Asterisk. Henry, PC2KY heeft een codeplug gemaakt voor een Hytera MD785 voor amateurs die naar de HamRadio 2015 gaan in Friedrichshafen gaan. Alle repeaters staan in de plug. 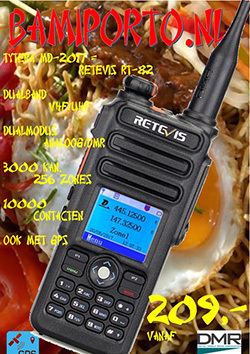 Tevens is de codeplug voor PD685G geüpdatet en bevat de laatste contacten en DMR repeaters PI1TDT en PI1WFR. 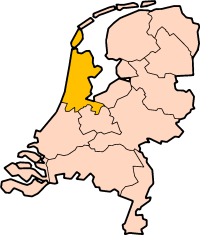 Beide pluggen zijn hier te vinden! Onderstaande overzichten geven een gelijktijdig overzicht van het gebruik van het Hytera en Motorola netwerk wereldwijd! 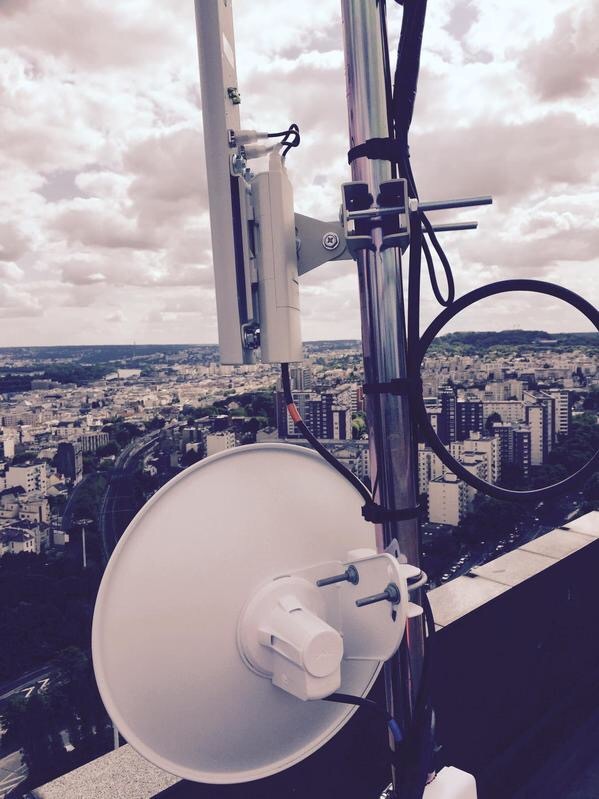 Dit weekend is de Franse DMR repeater F1ZOI van Parijs verbonden met de C-Bridge DMR-France via het Hamnet netwerk. Rémi, F6CNB de initiatiefnemer voor de Hamnet ontwikkeling voor Ile de France, was in staat om de apparatuur te installeren en de verbinding op te bouwen. De volgende prestaties zijn na diverse test bereikt: Een link op 5745 MHz is opgezet tussen de RC Clamart (F8KHQ) en la Défense (F1ZOI), met een 50 Mb/s doorvoer over 12 km. De reactietijd met de C-Bridge is teruggebracht tot ongeveer 25ms. F1ZOI is beschikbaar voor radioamateurs om een aansluiting te maken op het Hamnet la Défense. Op dit moment zal alleen de zuidzijde worden aangestraald met de antennes. Het verbinden van DMR repeaters aan het Franse HamNet zal worden uitgebreid met mogelijk DATV relais of D-Star repeaters. 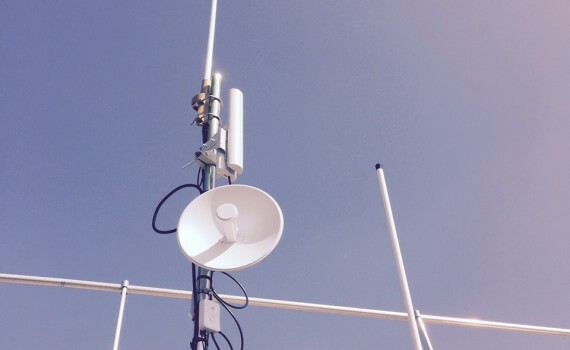 Hamnet is een geweldig hulpmiddel voor mensen die projecten willen realiseren over dit voor radioamateurs gereserveerde netwerk De DR@F – Digital Radioamateur France zal het netwerk gebruik gaan bevorderen en aanbieden aan iedereen.